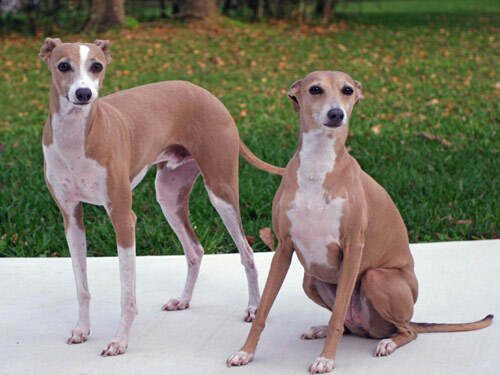 The Italian greyhound may appear on the smaller scale of this breed when compared to the rest of its family, but these sight hounds are not lacking in skill or energy. They are excellent runners and thoroughly enjoy a great chase. They are caring and compassionate dogs that may seem shy at first meeting, but can easily play for hours with little ones and other canines. The Italian greyhound is a loyal creature to their owners and while they may desire to protect them, they must be cautious as they can suffer from injuries due to rough play with children and even other hounds. They are rather affectionate, friendly and a breed that is considered easy to train as well. To provide your Italian greyhound with a pleasant lifestyle for years to come, you must commit to walking them. Also giving them plenty of room to run as they please at the very least, once per day. Many experts note it is best to locate a suitable collar for them one that is wide, soft to the touch and preferably made of hemp as this type of dog has a rather long and sensitive neck. Grooming the Italian greyhound is minimal, they generally only require a routine brushing to maintain their short and course hair. Greyhounds can survive comfortably in warmer climates as they have a high tolerance for heat also. The number one health concern any Italian greyhound owner needs be aware of is periodontal disease. This breed when not properly cared for, can easily develop issues with their teeth and gums. The greyhounds being naturally distinguished runners, can also develop leg fractures along the way in which some vets recommend testing procedures for their knees as they grow older. Patellar luxation and PRA (progressive retinal atrophy) are also valid concerns to consult with the vet should they become an issue. Poor eye function is a typical age-progressed ailment that almost every dog breed can suffer from. The average lifespan of an Italian greyhound is anywhere from 12-15 years with regular health checkups and active, caring owners. Sometime in the 1800’s the Italian greyhounds where discovered roaming places such as Greece and Turkey, but where the first one actually originated from is quite grey. They continued to habitat in the southern regions of Europe, also making their way to England. To this day, they still remain one of the most popular breeds in Italian culture so much so that when included in 1820 literature, the greyhounds were only one of two toy hounds even mentioned in the read. The breed went on to expand during the Queen Victoria era, but then shortly after World War II they decreased slowly in the UK. This decline was simply due to the popularity of breeding hounds that were smaller in size, and the greyhounds did not fit that description. Just before reaching the 1900’s, the breed came to America and began growing fame quickly. They are still growing in volume in the states and will continue to do so for their talents as very useful sight dogs.